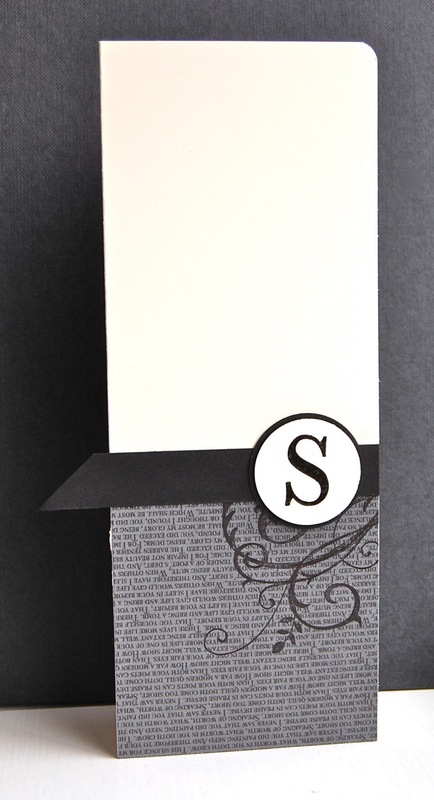 Stampin' Up ideas and supplies from Vicky at Crafting Clare's Paper Moments: Masculine Monday - Schoolbook Serif monogram! Masculine Monday - Schoolbook Serif monogram! Good morning! Today on Masculine Monday I've gone with the fantastic Less is More challenge again - I really can't get enough of this site. For their eighth challenge, Chrissie and Mandi have asked us to create a card using this fantastic sketch. I've been thinking for a little while about monograms and how classy they can look - and this sketch was perfect for trying it out! Always one for the quick and simple approach, I tried it with just the designer paper but it seemed a little plain - even for me! So I added the flourish from Baroque Motifs for a little extra interest. I didn't put a sentiment on the front of the card as it would've spoilt the simplicity of the design but it's easy to stamp one inside. I embossed the initial too, because it seemed important to make it really stand out. It looks beautifully crisp in real life (in ACTUAL real life as my daughter would say!) I would have used 5/8" grosgrain ribbon in Basic Black but I didn't have any and the lush satin ribbon I did have wouldn't have been right for a masculine card, so I simply used card stock instead. I let it overlap the side of the card and trimmed it on the diagonal. Cut an 8cm x 20cm piece of Very Vanilla card stock. Score and fold in half to make a card base. Curve the top, right-hand corner with your corner rounder. Cut an 8cm square of black Patterns designer paper and stamp it with the swirl from Baroque Motifs using Basic Black ink. Glue it to the card front. Cut a piece of 1.5cm x 10cm grosgrain ribbon or card stock in Basic Black and adhere to the top of the designer paper. Make a feature of the overlap by trimming it on the diagonal. Cut the initial out with the 1 1/4" circle punch. Using dimensionals, mount it onto a circle cut from Basic Black card stock using the 1 3/8" circle punch. Glue the monogram to the black ribbon or card stock strip. Other: Patterns designer paper, clear embossing powder, 1 1/4" and 1 3/8" circle punches, corner rounder. I hope you've all had a lovely weekend. I've been beavering away getting things ready for my open house to celebrate the launch of Stampin' Up's new mini catalogue. If you're in the Buckingham area on Thursday, why not pop in? I'll be here in the daytime as well as the evening and there'll be a free prize draw, a great make and take, loads of gorgeous things to see and the best of company! Call me on 01280 820593 for directions. Now, I must be off as I want to see what everyone else has made for the challenge! I'll have another male card for you tomorrow. Hope to see you then! Vicky, this is so elegant! I believe I gave all my alphabet stamps away...pooh! I do love how this came out! "I didn't put a sentiment on the front of the card as it would've spoilt the simplicity of the design..."I agree - the card is fabulous as it is. Great design. Love this - very crisp, very elegant, very masculine! I can imagine it in other colours too! Love the simplicity of this stunning card! You are right, monograms look really lasic and this Baroque Motif flourish compliments the card perfectly! Vicky, your cards are always a joy! I really love the clean lines of this super card. Was using the DP upside down intentional? I love that flourish stamped over it! See you next time for more inspiration! I love your card, Vicki, so sharp, simple in design and classy. For the lady who threw away her alphabet stamps, I am sure you could achieve a similar result by using the different fonts on your computer and embossing that. That swirl is a beautiful one. I love what you did with this sketch! 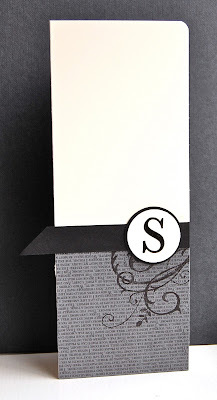 I love monogram cards and stamping the swirl on the DSP really makes this elegant! Thanks for posting this card! I have been struggling to use the DSP with words on the back- this gives me some ideas! As always, love your projects! So classy; I love the different elements you have pulled together to make this card. Gorgeous, I love seeing fellow SU demos on here!! Classically elegant Vicky. You never fail to please. This is so eye-catching. The flourish is the perfect touch. Beautifully simple, and just lovely. Wow! Stunning! The flourish was the perfect addition, Vicky! Super, simple S card! Beautiful elegant card Vicky love that flourish!